Garden thyme (Thymus vulgaris) is an easy herb to grow. It thrives in dry, rather poor soil. Despite this, my plant has grown like crazy through Sydney’s recent wet summer. 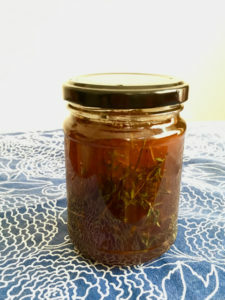 An ideal use for an excess of thyme in early autumn, is to infuse it in honey. It makes a handy home remedy to ease coughs and colds. Thyme is an expectorant herb (helps you cough up phlegm from the lungs), well known for its antispasmodic, antimicrobial and antibacterial actions. Herbalists use it for both upper and lower respiratory conditions, from runny noses to coughs. Recent research shows that thyme is a promising remedy for Helicobacter pylori, a common but stubborn bacteria that causes most gut ulcers. Honey’s medicinal properties are legendary, including being antibacterial, antiviral and antimicrobial. It goes perfectly with thyme to ease the symptoms of winter bugs. 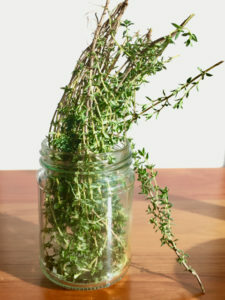 Run a glass jar and lid through the dishwasher or a very hot soapy wash. Once dry, pack it with freshly picked thyme. If the herb is damp or has any dust or soil attached, first pat it dry with a clean tea towel. Cover the thyme with honey (preferably raw, organic, local honey). Cover with the lid and leave in a warm place for two weeks to infuse. 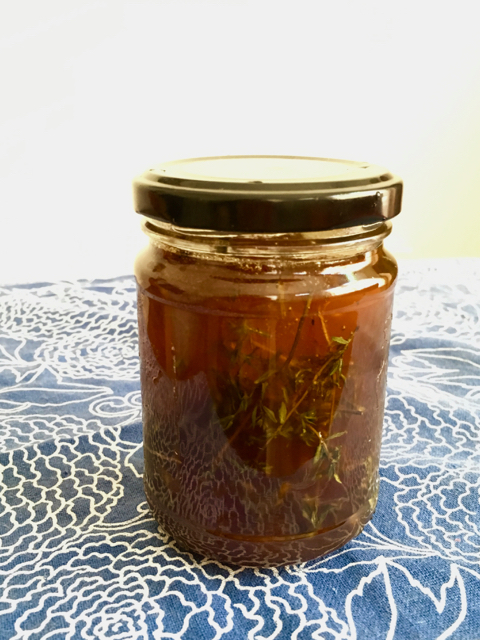 After this time, the thyme honey is ready to use and can stay in the pantry or fridge. Strain out the leaves if you wish. Adult dose: 1 tsp of thyme honey up to 4 times a day. You can take it straight off the spoon, or dissolved in warm water. While this syrup is traditionally used for coughs, colds or to soothe a sore throat, the combined research into both thyme and honey suggests there may be a role for treating gastric ulcers or using it externally for wound healing. In cooking, try it in marinades. Budding mixologists may like to use it in cocktails/mocktails. There are rare cases of botulism from raw honey affecting young children (usually aged under 6 months). As a precaution, avoid using thyme honey in the children under 1 year old or those who have a very compromised immune system.